In the centre of a rich cluster of galaxies located in the direction of the constellation of Coma Berenices, lies a galaxy surrounded by a swarm of star clusters. 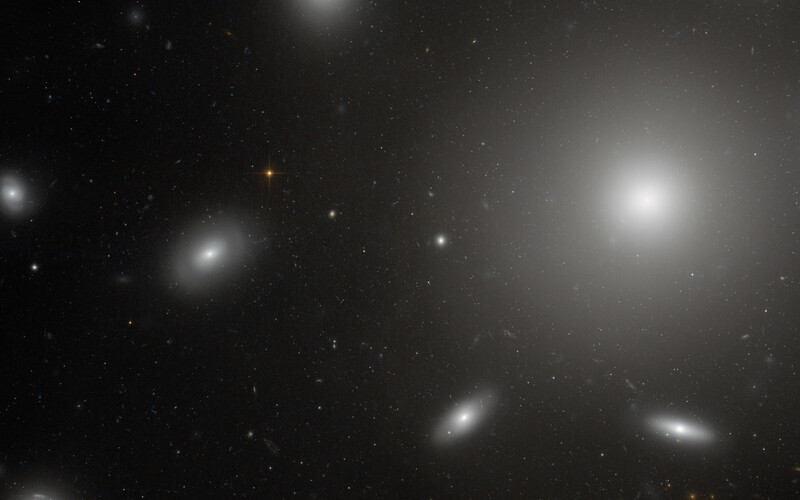 NGC 4874 is a giant elliptical galaxy, about ten times larger than the Milky Way, at the centre of the Coma Galaxy Cluster. 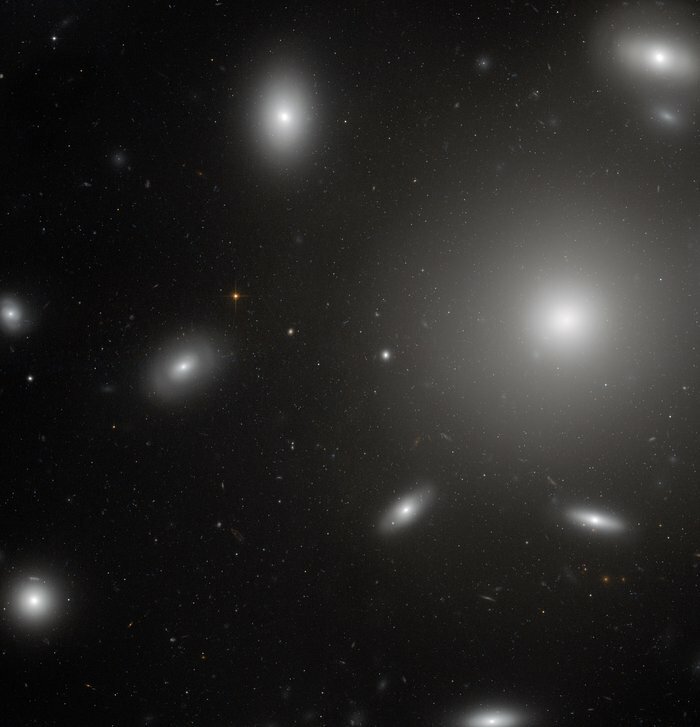 With its strong gravitational pull, it is able to hold onto more than 30 000 globular clusters of stars, more than any other galaxy that we know of, and even has a few dwarf galaxies in its grasp. In this NASA/ESA Hubble Space Telescope image, NGC 4874 is the brightest object, located to the right of the frame and seen as a bright star-like core surrounded by a hazy halo. A few of the other galaxies of the cluster are also visible, looking like flying saucers dancing around NGC 4874. But the really remarkable feature of this image is the point-like objects around NGC 4874, revealed on a closer look: almost all of them are clusters of stars that belong to the galaxy. Each of these globular star clusters contains many hundreds of thousands of stars. Recently, astronomers discovered that a few of these point-like objects are not star clusters but ultra-compact dwarf galaxies, also under the gravitational influence of NGC 4874. Being only about 200 light-years across and mostly made up of old stars, these galaxies resemble brighter and larger versions of globular clusters. 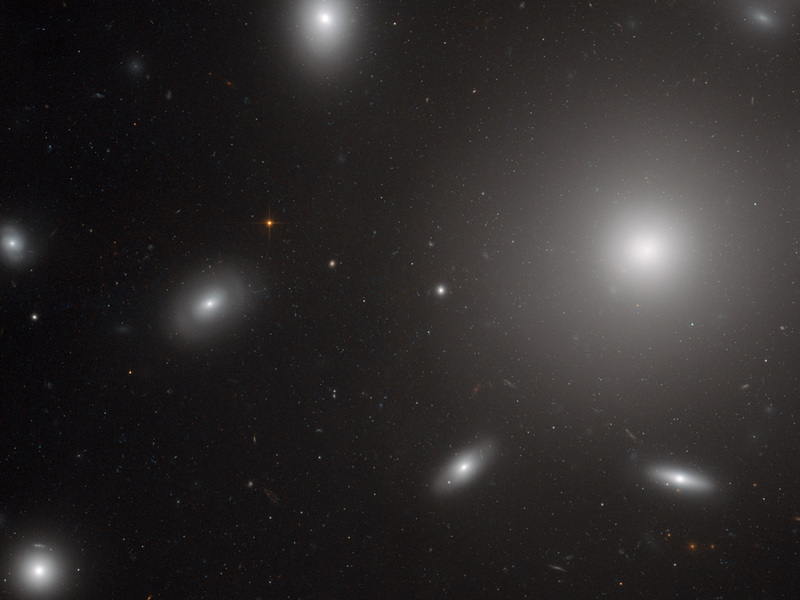 They are thought to be the cores of small elliptical galaxies that, due to the violent interactions with other galaxies in the cluster, lost their gas and surrounding stars. 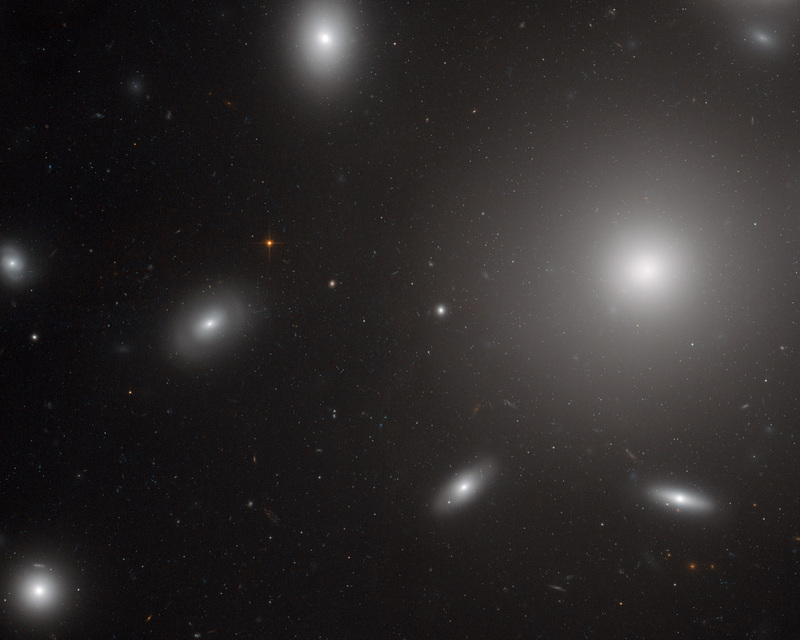 This Hubble image also shows many more distant galaxies that do not belong to the cluster, seen as small smudges in the background. While the galaxies in the Coma Cluster are located about 350 million light-years away, these other objects are much further out. Their light took several hundred million to billions of years to reach us. Most unusually, the image also shows a very faint blue satellite trail, extending across the whole image, from the upper left corner of the frame to the lower right. Because Hubble’s cameras can only see a tiny part of the sky at one time, such trails are very rare. This picture was created from optical and near-infrared exposures taken with the Wide Field Channel of Hubble’s Advanced Camera for Surveys. The field of view is 3.3 arcminutes across. Position (Dec): 27° 58' 31.70"